I a new nightmare. Came across a 2007 Chevy trailblazer with short to ground at the bcm (TBC2 keeps blowing). Found the short in the flat wire going to the BCM. Money in the bank right? NOT! Truck will start then shut of after a second. Found some aftermarket crap security system hooked in. I disconnected all that crap and turned back to OEM. Still nothing. I hook up the scanner and check for codes. I get a U1300. I can talk to all modules except the BCM. I check all powers and ground to the BCM and everything looks good. I check serial data line for shorts for ground and I get 139 ohms. Not sure I check the radio serial data line for short to ground and I get 60 ohms. My question is IS THIS NORMAL? My first thought is to change the BCM but I'm afraid I'll blow it with a short to ground. Last edit: 04 Feb 2019 17:54 by Dave101. Dave, just to clarify, you're finding 139 ohms of resistance on the light green wire at pin B1 at the BCM? Then 60 ohms of resistance to ground on the orange wire at pin A1 of the Radio? Also for our info, which modules had the U1300 stored? To answer your question, I have no idea if that's normal or not? I've never tested a Class 2 network for resistance, just with a scope on a voltage trace. If I see clean 0-7V square waves, I'm happy and don't test further. I'm inclined to say it's normal, just because you have communication with all the other modules on the Class 2 network. If there was a genuine short to ground interfering with the network, you wouldn't be able to talk to the other modules. So, I say if you find good clean square waves at the BCM, then your comm line is good. You could compare to the Radio (which communicates) to be certain. Went back to the car today with another scope and scan tool. Was able to look at the hi speed cans. I was getting a signal but only to 4vdc. I couldn't communicate with all of the modules in the car. I ended up going to the splice pack under the dash and one under the back seat. Disconnect the jumper links, and began bringing the modules on and communicating one by one. 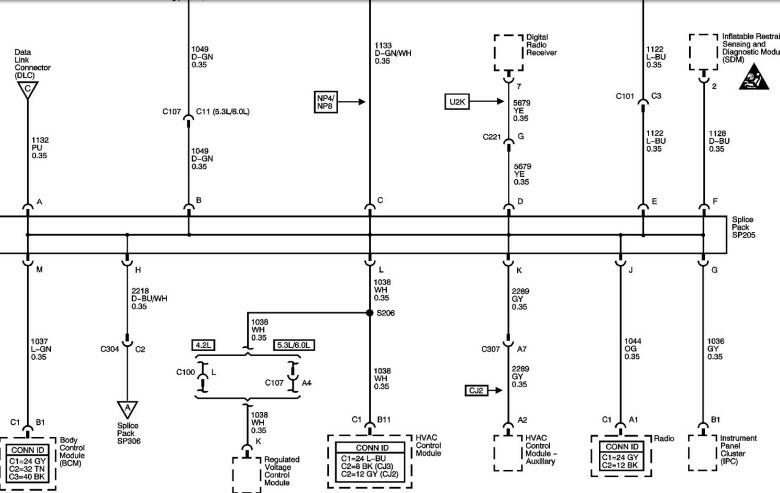 Was able to communicate with the BCM this way and could bi directionally make commands. The only one I could not communicate with this way was the instrument control module. I put everything back together and disconnected the ICM and BOOM. Car started and ran. All good thankfully. This was a nightmare car. Thank you guys for the help.